The flower arranging activity is a good example of the direct and indirect delivery system of the Montessori philosophy. On one level it is a creative and satisfying work. It also leads to work in the language, science, and art areas over the course of the three year primary program. 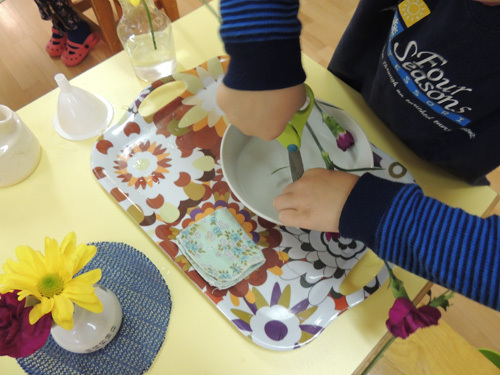 Comprised of a tray with vase, jug, shallow dish, scissors, bucket, funnel, and a supply of fresh blossoms, the flower arranging materials can be found in the practical life area of the Montessori classroom. The main purpose of arranging flowers is to provide children the opportunity to beautify and care for their environment. The work involves a long cycle of activity that gives the three year old practice in how to carry water without spilling, how to pour only just enough water into the vase, and how to gauge the length of the stem to the size of the vase. It is a delight to observe the young child who has completed her task, bearing a bright smile of accomplishment, as she stands beside a puddle of water gripping a tiny vase with a flower hanging precariously at the end of a long stem. The teacher guides the child in the clean up, making no correction, knowing the repetition of the work over the course of the school year will bring the perfection desired. The four year old, who has become adept with flower arranging, will begin to learn about the capillary action of the water that occurs during the activity when she snips the end of the stem off while it is submersed in a bowl of water. She is also working with the nomenclature cards from the language area to learn the names of the parts of the flower. The five year old, who has refined her writing and drawing skills, is now interested in dissecting the flowers, drawing the parts, and printing labels for a booklet on the topic. Her interest in botany may lead to a desire to find books to read about the science of plant life. 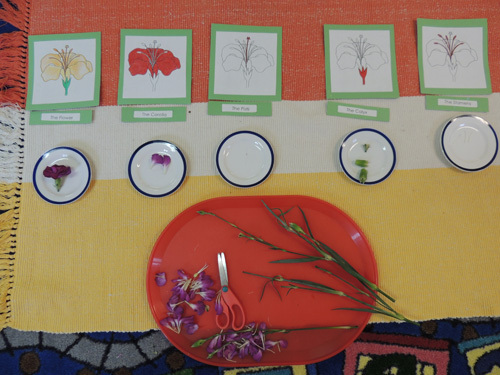 Blog, Practical Life Four Seasons Montessori Preschool, Montessori Flower Arranging. permalink.